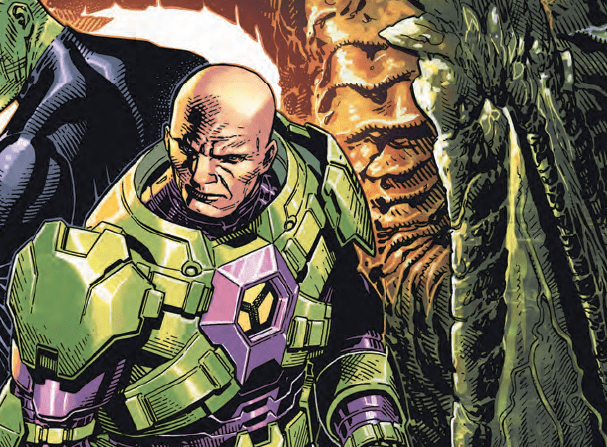 New origins: Details emerge about Lex Luthor and Martian Manhunter in Justice League #17 – AiPT! Scott Snyder and Jim Cheung deliver a surprising twist to both characters’ pasts. Justice League has been one of the best bang-for-your-buck series in the last year. The high-quality book always seems to contain big action, great plot progression and plenty of character work. Out today, issue #17 has a lot of the latter, revealing things about Martian Manhunter and Lex Luthor that change the characters indefinitely. The issue opens on Mars where we learn J’onn has asked Lex to meet him. Lex assumes it’s a trap but soon learns J’onn only wants to help him understand something about himself that could change him and potentially save the universe as we know it. It was a man J’onn met as a boy. We soon learn J’onn and the boy befriend each other while J’onn was kidnapped. It turns out J’onn is there to do something with his DNA. The two become friends and go on fun adventures using J’onn’s mind. Later on, we learn the truth, that the boy is Lex Luthor as a child. Lex doesn’t have the memories thanks to his uncle’s enemies wiping his and his uncle’s mind. The fascinating aspect of this is how Lex was good at heart and may have turned out differently if this bond he shared with J’onn wasn’t erased. There’s no proof per se, but it appears clear Lex believes it. Later in the issue, after arriving back at the Legion of Doom, Lex is alone with his thoughts and, it appears, he’s deeply regretful. How might this change Lex Luthor and his plan? Is it possible Martian Manhunter reawakened the good inside Lex and turned the tide of the war that is coming? Keep reading Justice League to find out! This is of course only part of the story. I highly recommend you read the entire issue, which you can purchase digitally today.